We are a community of individuals who practice primarily in the Insight Meditation lineage within the Theravadan Buddhist tradition. Our teachers and formal practice are closely aligned with Joseph Goldstein, Jack Kornfield, Sharon Salzberg, and other lay teachers connected with IMS and BCBS in Barre, MA. We are also informed by the Western Monastic Order of Thai Forest monks, centered at Amaravati Monastery in England, whose monks and nuns teach world-wide. For our latest news and announcements, click on the box immediately below this sentence. Save the Date: Saturday, May 11, Daylong Retreat with Manny Mansbach “Mindful and Brave” Cultivating a heart that balances courageous and determined qualities, in addition to kindness and love, to fully empower our practice and lives. 9:30 am-4:00 pm, St. Barnabas Church, Norwich. Manny is a Vipassana Meditation teacher with VT Insight. Details will be posted later. Sign up for car pooling to vigils for undocumented immigrant during I.C.E. hearings in Manchester. Also learn about actions at the NH State House during the current legislative session. Details on the UVIP page here. New Advisory Board Members We are fortunate that Michael Stoner and Suzanne Champlin have joined the Advisory Board. Meanwhile we bid fond farewells to Doris Hampton and Bob Metz for giving their time and talent generously to the Board. Current Board bios are here. A summary of a recent Board meeting is here. Our intention is to provide opportunities and support for exploring the teachings of Buddhism and practice of vipassana, also known as insight meditation. Wise and careful training of attention can lead to a more peaceful, steady mind and kind heart. This path helps us find the way to wisdom and compassion in the midst of our complex, stressful lives. We welcome all who are interested. United Valley Interfaith Project (UVIP) annual Micah award celebration. Please nominate one or more from our sangha to be honored. More here. Advisory Board: Gina Sonne is the VIMS president and Suzanne Champlin our treasurer. Mindy Schorr, Terry Cioffredi, and Michael Stoner complete the board. Brief bios are here. Bob Metz and Doris Hampton have resigned from the Board. Bob was our vice president, who had special facility with finances. He will coordinate the facilitation of the Tuesday sit while Peg is away this winter. Doris has been the head of the Retreat Team and will continue to do this. We thank these two very loyal, generous people for the time and talent they continue to give to Valley Insight. Diversity Policy Valley Insight Meditation Society is committed to offering a safe, welcoming environment for people of all races, cultures, ethnicities, sexual orientations, classes, religions, abilities and ages in which to practice meditation and to explore the ideas put forth in the Buddha’s teachings. We recognize that all people hold unexamined beliefs, assumptions, fears and prejudices about others, and especially about those who seem different from themselves, and we acknowledge that these beliefs are a great source of suffering for individuals and societies. We strive for inclusivity, kindness and generosity toward all, in our programs and in our hearts. 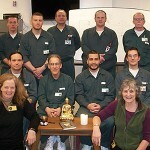 Prison Sangha – Consider joining us for our regular visits with the prison sangha at the New Hampshire Department of Corrections in Berlin or volunteer to be a letter-writing correspondent with an inmate. View photos of the prison sangha. Consider becoming a member of Valley Insight. Learn about other ways to be involved in Valley Insight. Read reflections on Dhamma practice and Buddhism by Doreen and a Valley News interview of Landon about volunteering at the prison.